Hey friends! Are you ready for fall? I sure the heck am! And I’m happy to see that I’m not the only one who is. 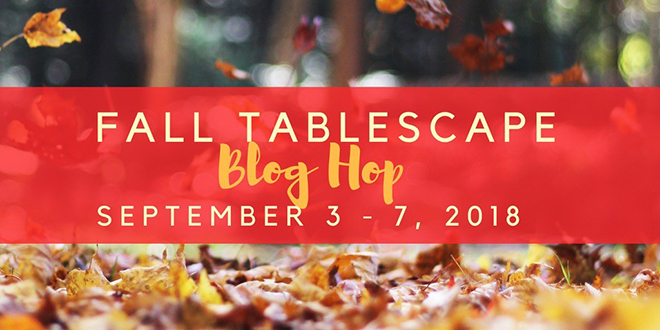 I’ve joined 19 other talented bloggers who love to decorate for fall early to bring you the Fall Tablescape Blog Hop hosted by Chloe over at Celebrate & Decorate! Ready (for fall) or not, here we go! Our dining room is in the southwest side of our home. This means we get to see the lovely colors in the sky at sunset this time of year. It also means if I’m taking pictures of this room, I need to do it before noon or this room will get blasted out with sunlight and all you’d see is the silhouette of everything against the windows. 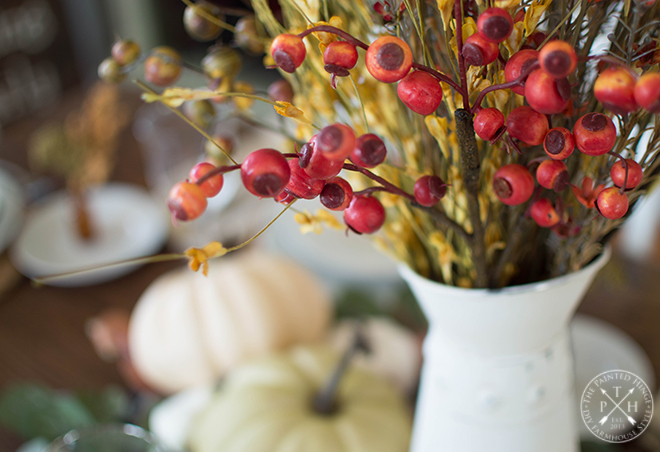 Call me a rebel, but even though I love neutral decor, I can’t not use traditional fall colors in my fall decor. Don’t get me wrong – I love the whites, creams and greens some stick to for fall, but I just love fall colors too much to not use them. The only fall color I avoid is bright orange as it tends to overpower everything else. I am really happy with how this tablescape turned out, so I took like 30,000 pictures of it. Okay, maybe not that many, but I did take a lot. I got all the faux flowers and pumpkins from Hobby Lobby, Amazon, and the dollar store. I like to use real pumpkins and gourds in my decor too, but I planted them in my garden too late this year and the stores around here don’t start selling them until October, so the faux stuff it is. 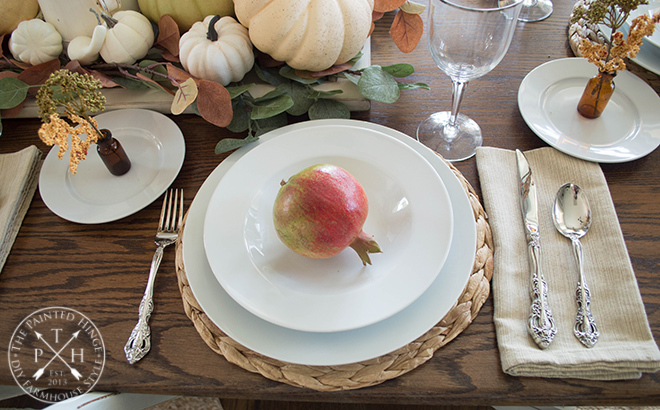 We are lucky to have pomegranate trees, so I picked a few to use in the tablescape. They’re not quite ripe yet, but they make a pretty topper for the plates. I recently painted all our kitchen cabinets, including the ones underneath the pass through behind the table. I didn’t realize I forgot to put all the plates back in the cabinets until I took this picture. I stored the plates in a closet while I was painting, so out of sight, out of mind and I got so busy with other things that I totally spaced putting them back. I warned you about all the pictures, right? I love my amber bottle collection, and I especially love that I remembered to pull them out to use in my fall decor this year. I can’t share a tablescape without sharing at least a couple of pictures of my hutch. 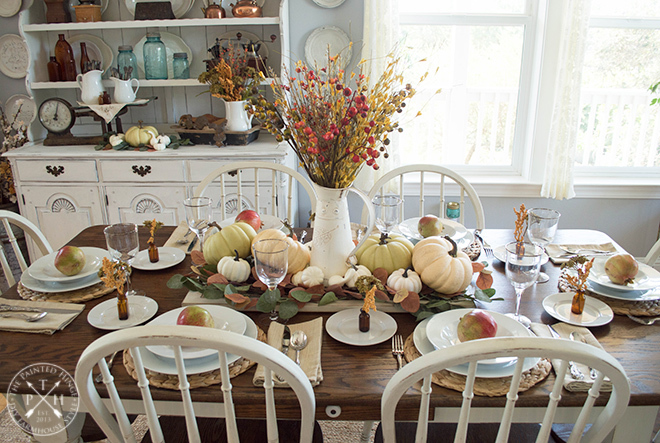 I hope you enjoyed my farmhouse fall tablescape! 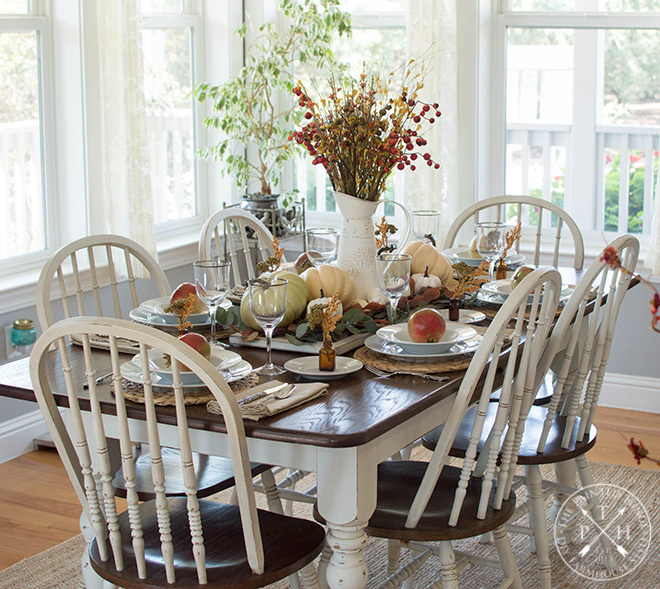 Make sure to check out the rest of the fall tablescapes at the blogs in the links below. Links will be updated every morning this week as the group of blogs for that day go live with their tablescapes. Thanks for stopping by and enjoy the rest of the blog hop! Michelle I love the Fall colors too and I have to include them in my Autumnal tablescapes. The amber bottles are adorable and a perfect accent for your table. 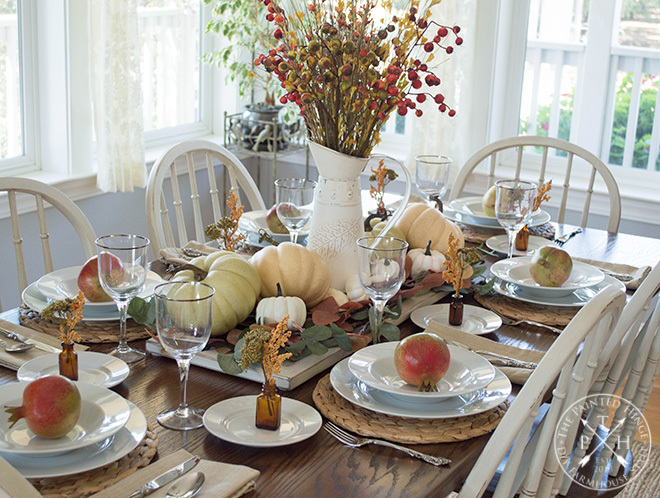 The pomegranates are perfect on your white dinner plates and the pumpkin centerpiece with the white pitcher of Fall foliage is so pretty. I did notice the empty shelves behind your glass doors…isn’t it amazing what we see once we take a picture. We can look at something all day and until we look through the eyes of the camera lens, we can miss certain elements. Welcome to our blog hop…it is such fun isn’t it? Thanks so much Kari! Yes, it is a lot of fun! So happy to be a part of it with you lovely ladies! 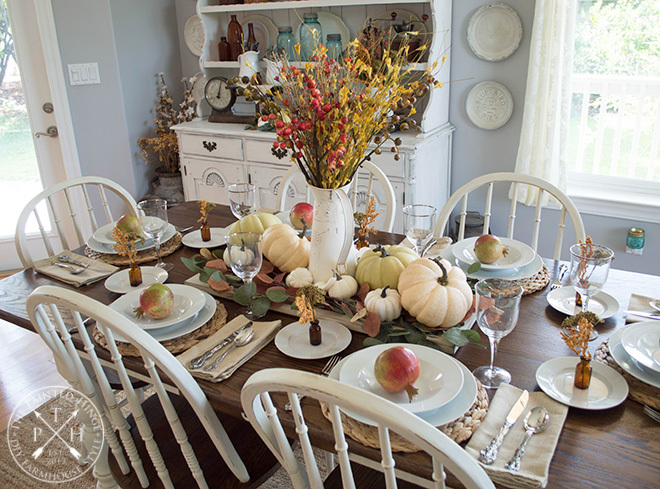 Michelle, your tablescape is so bright and shining! Love you choosed the pomegranates, they add a perfect touch of simple elegance. Absolutely lovely! Michelle, your table is very calming with how you’ve set it. I think the pomegranates are what really make it stand out! They are the stars! 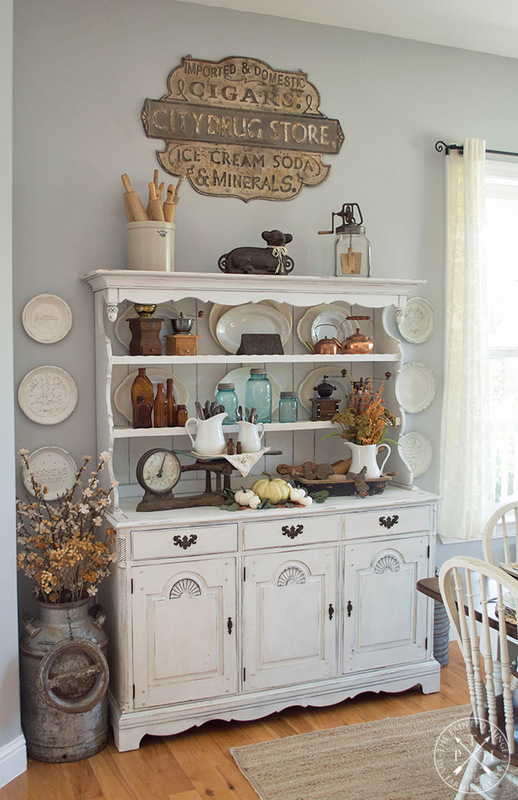 The hutch is a great complementary piece in how it was styled for the fall home tour too. Lovely! Southwest exposure for fall and winter can’t be beat! Thanks so much Mary! I got the drug store sign from Decor Steals. 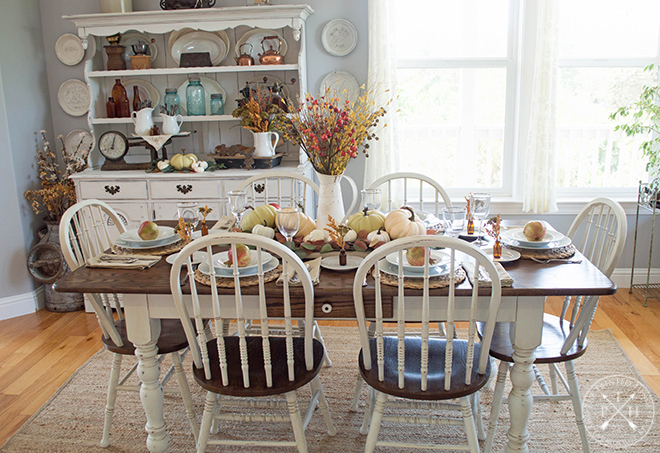 Michelle, your farm house table is striking – all the bright light coming in your beautiful windows with those wonderful touches of fall color just popping out of your photos. It is hard to get such beautiful photos against all that light – you did a fabulous job. I am crushing on your drug store sign!!! too cute!!! Thanks for joining us with the hop! Thanks so much Ann! I got the drug store sign from Decor Steals. So, so sweet and lovely! I can’t wait for Fall!!! Your centerpiece is stunning, and I also adore those little amber bottles. What a lovely table! Apples is the perfect touch! You have such a beautiful home. I could spend hours looking. Love how it all feels like a magazine cover shoot. Awe thank you so much Maria! 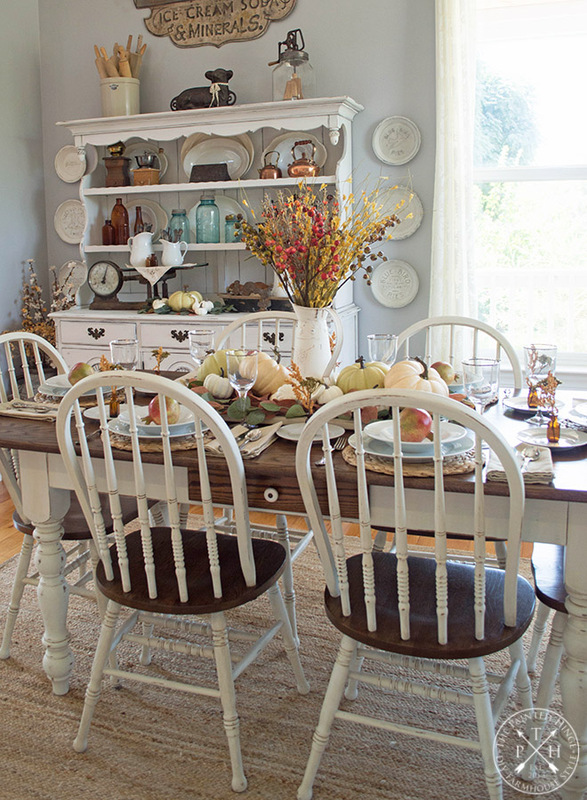 You have such a beautiful house, and I love your gorgeous fall table! I’m like you…I like fall colors, too! It has been so much fun being on this blog with you. Happy Fall!!! Thanks so much Shannon! It’s been fun being on this hop with you too! So charming and lovely Michelle! 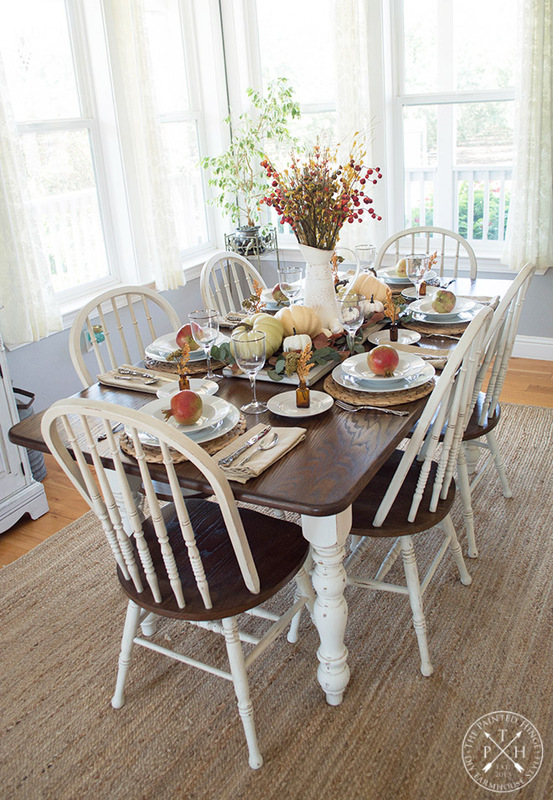 I agree, neutrals are always pretty but fall decorating needs some depth with earthy colors. I like to start out slowly in September with sunflowers and soft browns, peak in October with brighter colors for Halloween, and then go neutral in November to rest the eyes before Christmas reds and greens. Your room is lovely and I love the copper mixed with the blue jars on your sideboard/ hutch. Too funny you forgot about putting the plates back in that awesome handy cabinet! Michelle, you have a pomegranate tree?! 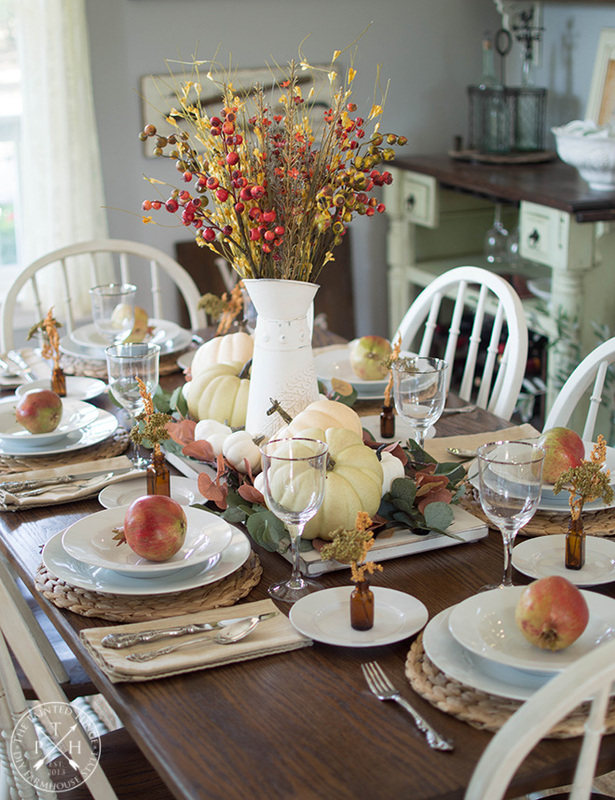 The fruit is picture perfect and an inspired choice to incorporate into your tablescape. You must have green thumbs and toes LOL! Thanks so much Debbee! I wish I could take credit for our pomegranate trees, but they’ve been big and produce like crazy ever since I was little. My grandfather was the one who probably planted them and he always had a green thumb! 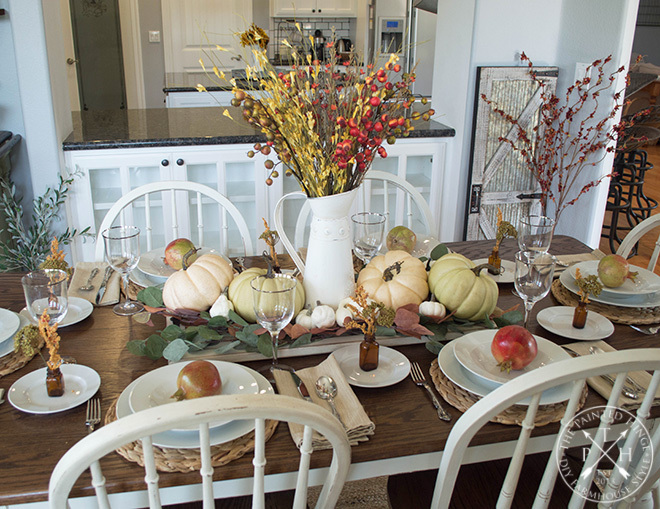 Michelle, your table is a beautiful welcome to the fall season. Your neutral colors are stunning. The pomegranates add the perfect finishing touch. How funny that you forgot to put your plates back, sounds like something I would do. 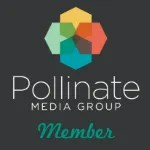 It is a pleasure blog hopping with you! Thank you so much Pam – it’s been a pleasure hopping with you too! Your room is so warm and welcoming. At first glance I thought your pumpkins were real and I was a little envious, since you can’t find them here in Florida yet, either. How fortunate you are to have pomegranates to pick, they are the perfect accent on your dinner plates, suggesting the fall harvest will soon be upon us. I love hw you nestled the pumpkins on a tray with a bed of greenery. 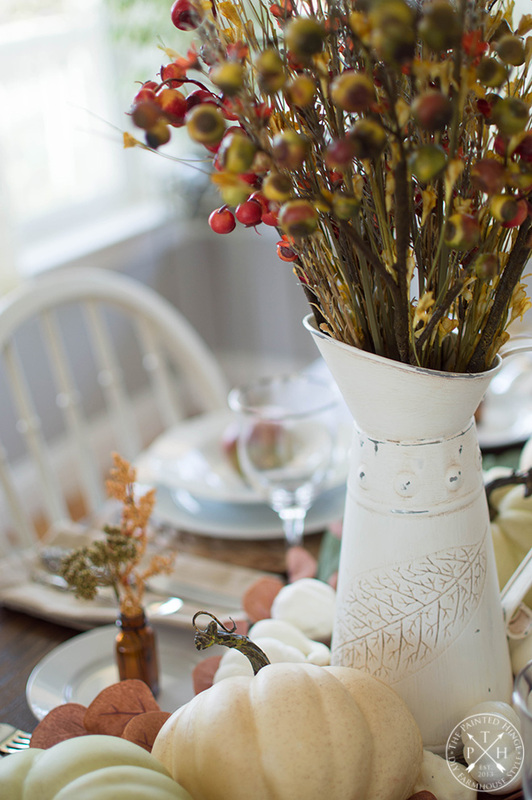 Thank you for joining us for a tablescape blog hop! You’re very welcome Chloe – thank you so much for inviting me! It’s been a ton of fun! Michelle, great job of creating a soft definitely fall feel without bright oranges ~ I’m with you on that score. Love your table with the white base and dark top. The white French-looking pitcher is a awesome piece to use for flowers. I have blue mason jars, too, so my eye caught those. Great to “see” you again. Thanks so much Carol! It’s great “seeing” you again too! Very charming and I was instantly drawn to the centerpiece and the base it sits on. Like the others, I think the pomegranates are a nice touch. Gorgeous table and I hope you blog hop with us again. Thanks so much Sandra! I hope I do too! That is so beautiful and inviting. I love all the light you have coming in from the windows in your dining room. And don’t even get me started on the hutch. I have a hutch fetish. LOL! I have 5 scattered throughout my home. Thanks so much Kim! And I have a hutch fetish too. I only have this one right now, but I have two more in our shop waiting to be refinished. 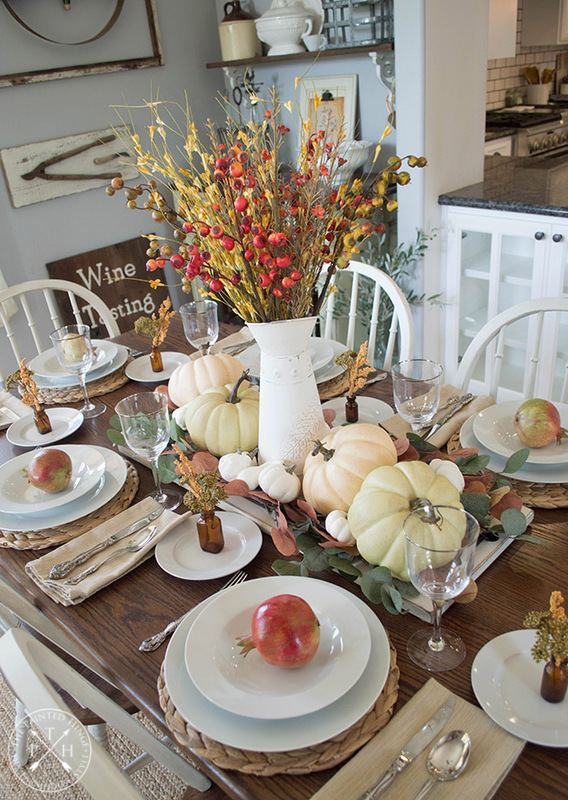 Michelle your fall tablescape is adorable! I love your soft color scheme, so perfect for early fall. 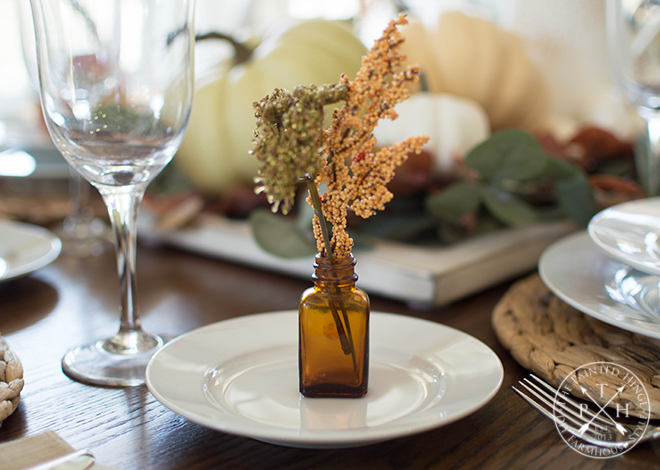 I just love how you set the little amber glass bottles on the table filled with fall florals too. So excited to be on this hop with you and to see all of your fall decor throughout the season! Thanks so much Amber! 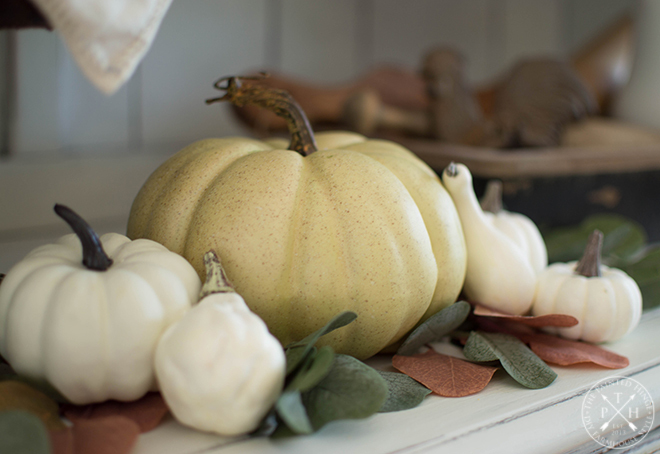 I can’t wait to see all your fall decor this season too! 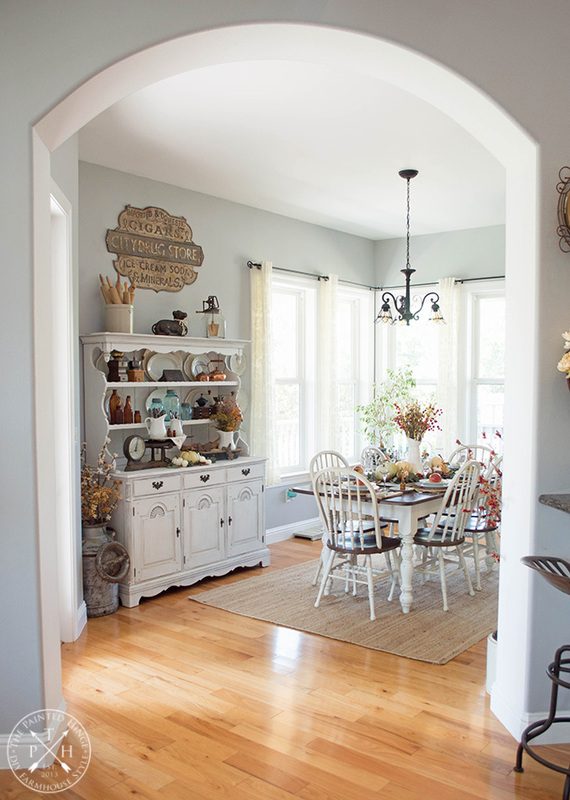 Michelle, What a pretty dining room! You are blessed to have great light. Light feeds my soul! I love the archway into your room. 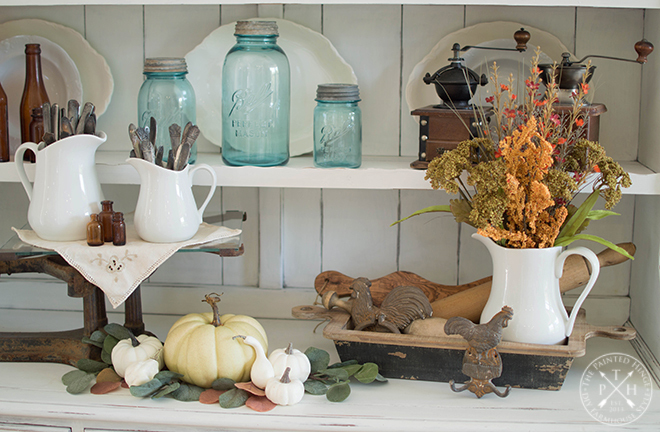 Your farmhouse fall table is charming. The pomegranates on the plates added just the right touch! How wonderful to have your own tree. 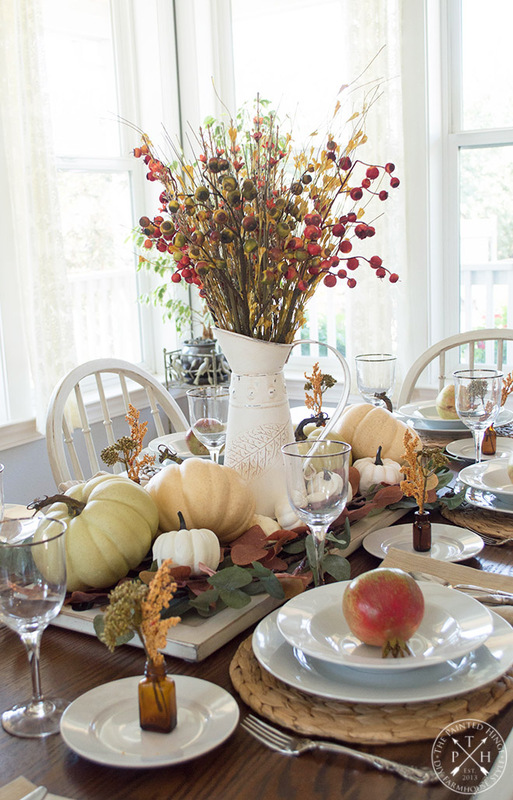 The pitcher of fall foliage centerpiece is a great accent. I think you did a great job designing your table. Michelle, your table is so lovely. The farmhouse look is so inviting. The neutral colors are so refreshing. That french pitcher is beautiful. Adding the florals and the pumpkins is wonderful. Your hutch looks so pretty the way you decorated it. Great collections as well. The sign is awesome, is showstopper. Happy to join you on this tablescape journey. Welcome. Thanks so much Linda! The sign is my favorite thing about my dining room. 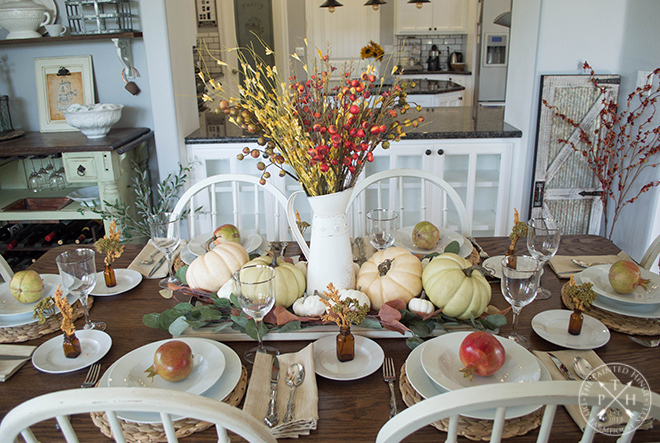 Michelle, I cannot say enough about your gorgeous farmhouse fall tablescape!! From the centerpiece to the pumpkins and pomegranites. It is divine!! Thank you so much for the inspiration!